Consider installing electronic deadbolt locks as a modern alternative. They operate similarly to traditional locks, minus a physical key so no guess work involved! Electronic deadbolt locks are the latest technology on the market and we offer multiple varieties to meet your individual needs. Keypad locks add an additional layer of security. 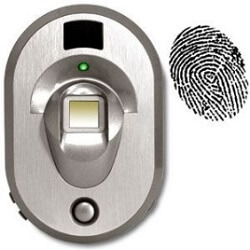 If you are looking for something even more secure, biometric systems require a fingerprint scan to open the door, ensuring only an authorized individual has the ability to enter the premises. We install keyless entry systems and bluetooth locks regularly and have found our customers appreciate the extra peace of mind they provide. They can be unlocked via your smartphone from anywhere, allowing you to open the door for guests when you are away without having to give away a set of keys. Call today for one of our free security audits and receive more information about how yo ucan step into the future.